If you don’t get the title, see here. Out next door neightbor, Lilly, the rescue greyhound spends the summers in very northern Minnesota, just a few miles from Canada. She’ll be back in autumn. Meanwhile, things are a bit crazy in Minnesota. Lilly is a little unclear on the concept. She’s having a little problem with the local wildlife there. Here she is-being chased by a deer. Say what??? Poor thing. Being chased by deer can’t be fun one bit. Not one bit. I’m just a bird, but I thought it was supposed to be the other way around. Those are some tough deer! Probably. I didn’t get to interview them because the peeps wouldn’t let me out of my cage. That could be a new sport. 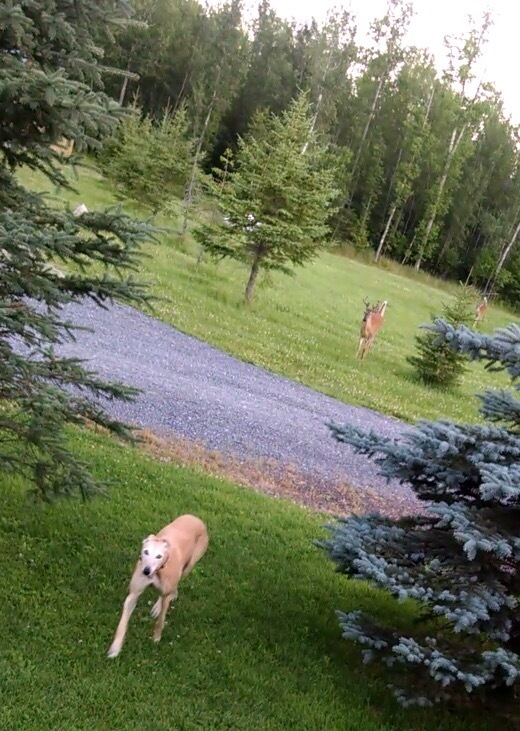 Instead of greyhounds chasing rats or squirrels, you can have deer chasing greyhounds. Sounds like fun! Florida could have exacta betting on the new style greyhound races. Then we’d have rescue deer. Fauna dyslexia? Eek, those Canadian deer are kind of scary. Deers are for barkin at, not for bein chased by. That is definitely the terrier point of view. More likely, MAD. In every sense of the word. Oh dear ~ deer can be very aggressive to dogs. They have even been know to kick a dog to death. So Lilly if that is the territory the deer have claimed I would say Run Lilly Run. There’s another deer in the background joining the fun. let’s say a bear would be harder to bear… but anyway…Run, Lilly run… that guy has some dangerous weapons on his head…btw:is that called poaching too if the game chases the dogs?… or is that pooch-ing? I fear for Lilly. The reason she’s there is that she was zero for three at the races with no talent. Maybe if they didn’t have Lilly chase a mechanical rabbit but had real deer chasing her, she would have done better. Mama is conflicted. 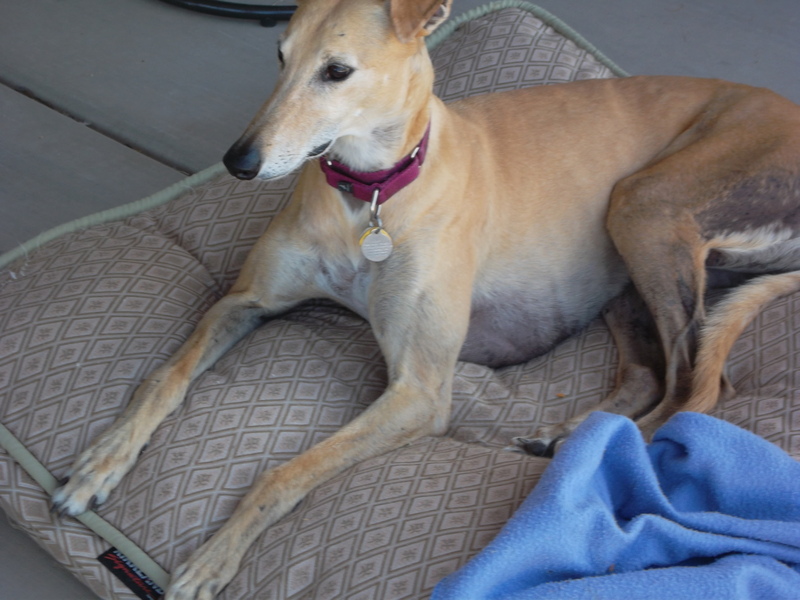 On one hand, she experienced Greyhounds attacking her Scottie Noah. One had him by the neck, another by the tail. His neck was bleeding. Mama got supernatural powers and got Noah away from them. So while Lilly is probably a Princess, there is a perverse pleasure in seeing this photo. That being said, we are glad Lilly was not injured, and we bet it was a bit scary for her. It probably varies by individual. Lilly lets Kali stand on her hind feet and give Lilly kisses. Lilly wouldn’t have done anything mean to Noah. Oh I got to say poor Skyler was had by the head and the tail ~ why they were stretching him into a doxie. Why that is the rack of torture for sure. It’s how the dogs are trained and treated. Ya don’t see dat everyday! You think any of Santa’s reindeer would be that mean? Run Lily run! That’s a far distance from Minnesota! Lilly was a bad sprinter, not a marathon racer. You put the fear of God into Kaci and Kali with the dentist mention. Not me, I’m a bird who has never had any teeth. Being chased by a deer? That ain’t right. You wouldn’t let it happen to you, Ainsley.